Patients need clean hands too! One of the first things you'll notice when you walk into any hospital or nursing home is that there are hand sanitizers everywhere. They're spread out every 20 feet or so in every hallway. They're next to elevators, bathrooms, vending machines, cafeterias and inside just about every patient's room. With all those hand sanitizers, you would think that everyone in the building has clean hands. Not quite. While it may be true that every staff member and visitor has clean hands, odds are just about every patient in the building has dirty hands. I've spent a lot of time in hospitals and nursing homes and I've never seen one that pays attention to the cleanliness of patient's hands. That's pretty bad. Cleanliness should be next to Godliness. 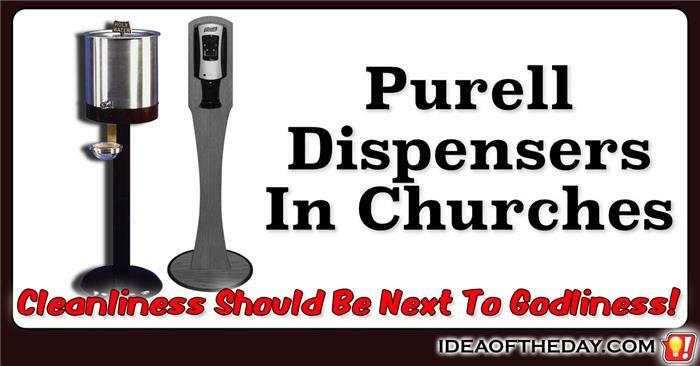 The first thing you see when you enter a church is a vessel filled with Holy Water that people dip their hands in to bless themselves as they walk in or exit. This water is a symbolic reminder of a believer's baptism into the faith. When you take a gathering of hundreds of people, including children of all ages, there's bound to be at least some people with dirty hands dipping into the water. For this reason alone, doesn't it make sense to put a Purell hand sanitizer dispenser somewhere nearby? Even if most people don't use the sanitizer before dipping their hands, those who are concerned with picking up germs can use it right after they dip. 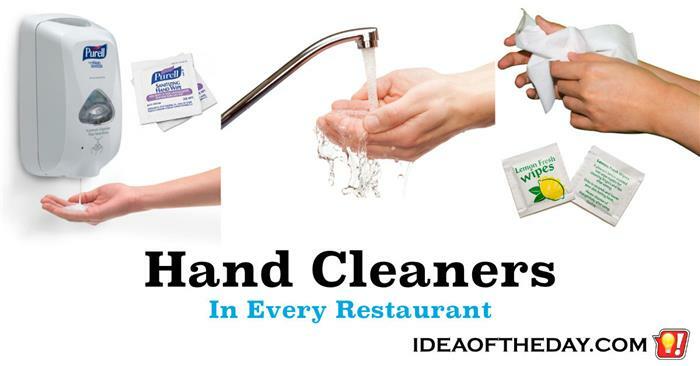 Cleaning your hands before and after eating is not a new idea, but very few restaurants think about it. Like most people when I'm home, I tend to wash my hands just before eating. It's almost automatic. I don't even need to list the benefits. The idea of washing your hands before eating has it's roots to traditions that are thousands of years old, long before people even understood the benefits of removing germs. With that in mind, why are there so few restaurants that offer their customers an easy way to wash their hands, before or after eating?